You are here: Home / Farm to Fork / Try Tea Eggs For The Perfect Afternoon Snack! 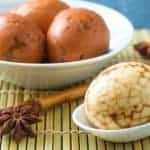 Tea eggs are a traditional Chinese treat – and they’re easy to make on your own AND use up all those eggs your flock is laying! Hard boiled eggs are great – don’t get me wrong. They’re easy to make and you can boil a dozen at a time and have an easy meal in minutes. But after a while, they CAN get a bit boring. Especially for children, who appreciate more visually appealing food. So why not try boiling eggs with your favorite tea and spices? 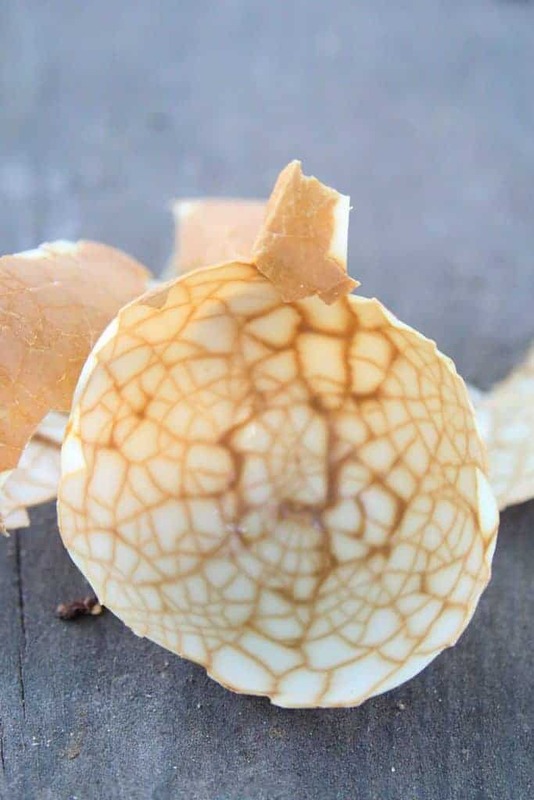 Tea eggs aren’t just edible – they can also be very beautiful, depending on the length of time eggs are steeped in the liquid. 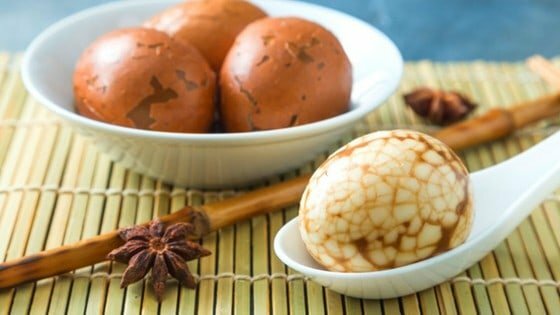 The cracked shells allow only a portion of the spiced tea into the egg – which gives the final product a beautiful, marbled effect. You can even dispense with the entire shell, and allow the egg alone to steep in the tea. 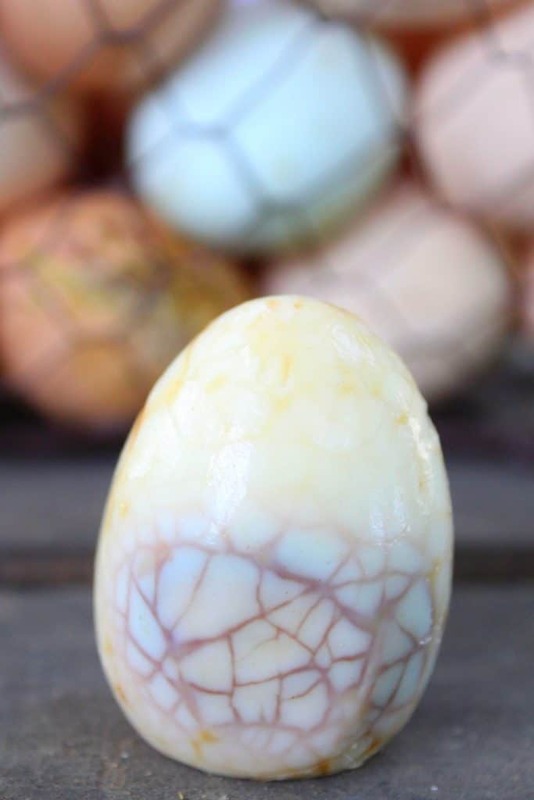 It won’t be a showstopper like a marbled egg, but contrasting dark and marbled eggs on your plate will still be lovely! To make tea eggs, hard boil eggs for 10 – 15 minutes. Be sure to use eggs that are at least 7 days old for the best experience removing the shell – if they’re half floating when you try the egg float test, they’re perfect. In a separate pot, add 3 black tea bags to boiling water along with ¼ cup soy sauce and the spices. 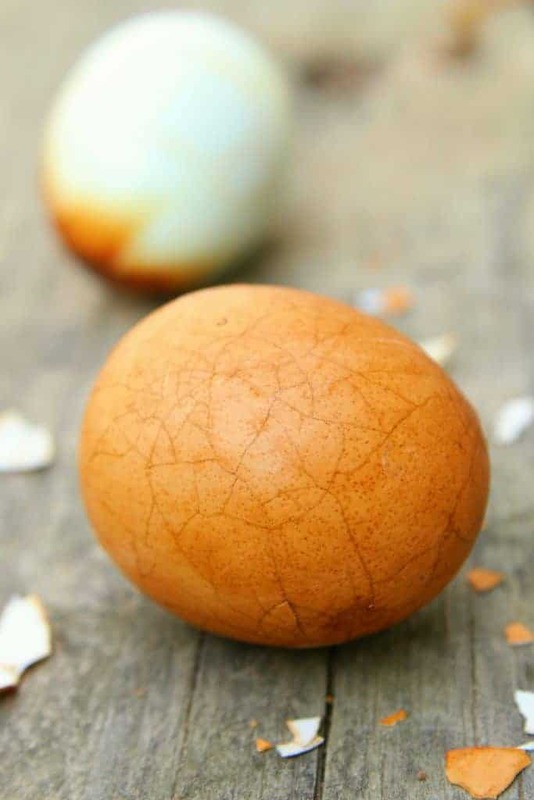 Once the eggs are hard boiled, shock them in cold water, and crack the shell slightly when cool enough to touch – don’t remove it, just roll the egg back and forth under your palm or use the back of a spoon to crack it slightly. Next, steep the cracked eggs in black tea and a variety of spices for at least 1 hour to create a savory snack. Keep the tea simmering while the eggs steep. While any tea would work, black tea is dark enough to give the marbling effect. You can steep the eggs for an hour or up to several hours – the longer, the darker and more flavor your eggs will soak up. Star anise, cinnamon, and cloves are some traditional spices used, and you can even include some orange peels for additional flavor. Of course, you should experiment with YOUR favorite spices! This will also work with duck eggs! After steeping the eggs, remove from the tea mixture and allow to cool. You can shock them in cold water again to make removing the peels easier. When the eggs are cool to the touch, remove the shells and enjoy! You can still feed the eggshells to your chickens – so they’ll get a treat, too! Hard boil chicken eggs for 10 – 15 minutes. Once the eggs are hard boiled, crack the shell slightly by rolling the egg back and forth under your palm to crack it slightly. After steeping eggs, remove from tea mixture and allow to cool. When the eggs are cool to the touch, remove the shells. Sounds interesting. I am going to try this. I have chicken and duck eggs. Thank you! !